The Schwinn Arrow was discontinued in April 2017. The Schwinn Arrow is a fixed wheel jogging style stroller that came in last place tying with the Grand Safari. It only managed to earn 47 points out of 100 with only 1 above average score in any metric, the Ease of Setup. In general, we felt this stroller performed poorly in some of the most important metrics for this style of stroller, including run-ability and maneuverability. Given that is has a list price in the upper half of products tested we feel it should have ranked higher. In the end, it feels like a cheaper product getting by with the Schwinn name to make sales. The Schwinn Arrow is a fixed wheel stroller with 16" alloy wheels and pneumatic air tires. It comes with a parent tray that has dual fin grip cup holders and smartphone tray. It has exposed rear dual shock absorbers, and a retractable canopy to keep passengers comfortable. The canopy also has a built-in speaker for connection to an MP3 player or a smartphone. It has a rubberized handlebar that is slip resistant and a removable fleece seat pad that is machine washable. It comes with a 5 point harness, quick release wheels, dual brakes, and a double release folding system for extra safety. The chart below shows a comparison of all strollers tested in this review. The sections below include information on how this stroller performed compared to the competition. What is a stroller of this type if it isn't something you can run with? For run-ability, it earned a 3 of 10 in our tests which isn't much to sing about given that the Thule Urban Glide 2 and the BOB Revolution Flex came in with a score of 9. The average score for running for these jogging products was 6 for all the products for this review, so it scored well below the average as well. The lowest product, however, is the Graco Fast Action Fold Jogger with a score of 2 for being heavy, hard to control, and lacking adjustable tracking. Our runner stated that "this is a terrible running stroller… that is not fun for runner or passenger." The Arrow has an adjustable handle that can help you obtain the right biomechanics for running no matter what your height. The suspension is only average compared to the competition and it isn't adjustable so no matter what the terrain or how large your baby, it is what it is. This is better than not having suspension, but given that much of the competition is adjustable it is a disappointment. It doesn't offer adjustable tracking, and given that much of the competition does, especially the fixed wheel strollers, it is a disappointment and means you might be frustrated trying to keep a ride on track if it is slightly off kilter for some reason. It is one of the lighter weight options and it is easy to tilt back to turn while running so these things help prevent it from ranking at the bottom of the pack. It also has significant rolling resistance compared to the competition, with only 1 product having a higher resistance factor. In our experience, this stroller was easy to push and tracked relatively well. The stroller we purchased has a ton of flex in the frame which meant we had to exaggerate our turning motions to compensate for the flexing. It can take a few minutes to get used to the loose frame, but even with bigger bumps, it managed to stay upright and not toss any of its contents in spite of the wibbly wobbly motion of the ride. Our professional runner feels this stroller is unstable and difficult to control, resulting in extra work for the runner to keep it in position. This isn't easiest stroller to maneuver earning just 4 of 10 for pushing and turning on the pavement and hard surfaces. The surprising factor is that it scored better off road than it did on road. So while we think the fixed wheel is safer off-road, we didn't expect it to be better at maneuvering off-road. In general, fixed wheels are harder to move around given that their front wheel is fixed and turning requires that you lift the front wheel up for small adjustments in direction, but the fixed wheels aren't all created equal as evidenced by the difference in scores. The top scoring fixed wheel is the Thule Glide 2 with a 7. 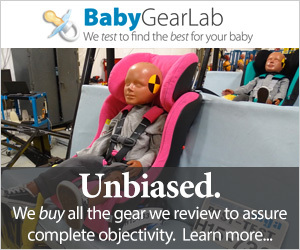 The lowest scoring product is the Graco that earned a 5. For ease of pushing on hard surfaces, it is about the same as the BOB Ironman. It is just a tad longer when tipped back, making it not the stroller to run a race through the store with. Of course it is pretty easy to push but of course, it is harder to turn because of the fixed wheel and tippy on the side hill part in comparison to the competition. It pushes nicely in gravel and easily rolls over bumps. However, there is a lot of flex in the frame that makes it less responsive in general and kind of a pain to push for long distances. The Schwinn brother strollers came in last place for ease of use in our tests with 4s of 10. The average ease of use score was 6, with the high score for ease of use being a 9 for the Burley Solstice. It really is hard for the competition to compete with the Burley that had a little something for everyone and managed it all with grace, style, and above all, ease. The under seat storage for the Arrow is large and has rear and side access. It has a max weight limit of 10 pounds, but it is hard to access and kind of a pain to get our large diaper bag into and out of. Both of the Schwinn stroller storage bins are terrible because of the bar in the back that blocks good access, especially for larger items. We had trouble fitting the large bag in without fighting with it. We almost tipped the stroller over trying to get it in. It would probably hold the same amount of items that are in the bag, but you'll have to take them out of the bag. The cup holders in the parent console are some of the best in the group because they have a better than average rubber gasket around them that helps hold taller water bottles in really well; even when we tried we couldn't shake them out. The covered compartment in the center is, unfortunately, small, it doesn't hold a bigger phone and barely fit the MotoX. Those who have large keys might have to pair down, and those with larger phones will be annoyed that there is nowhere useful to put it. The in canopy speaker is something of a joke and we wonder why they bothered. It is hot glued together and it is free standing with no cover. It looks like it is not going to stand the test of time, and the sound is no better than the speaker that comes with your smartphone or a portable speaker you could use with Bluetooth. It is not weather resistant and it doesn't go loud enough for little ones to hear over passing traffic or winds at speed. It is more just a check the box for accessories than it is a useful addition to the stroller wars. The canopy on the Arrow is easily the smallest sunshade in the group. It does not cover far enough to keep knees from getting burned unless you pull it forward and burn baby's head. The sun visor is completely clear, so we are left thinking maybe this is for rain? only it isn't large enough to work for rain. To be honest we don't think it has a use. It does offer good ventilation through the back of the shade if you roll up the back flap. You will need to take the whole canopy apart if you need to remove it for any reason. There are hook and loop closure for the peek-a-boo window which is also small and made of vinyl. In addition, if you fold the canopy all the way back it interferes with opening and closing of the compartment of the parent console. The seat on the Arrow is a one hand recline, but it is a little stiff and not intuitive. It the upright position it is 57 degrees from flat, and in its most reclined position, it is 21 degrees. The front edge of the seat curves down nicely with an adequate hard plastic footrest that will likely wear well over time. The quality of the Arrow is not great and it earned the lowest score for this metric of only 5 of 10. The average quality score is 8 for this review and the Thule Glide 2 earns a high of 10. Both of the Schwinns have fairly smooth "plastic" feeling fabric that snagged easily for us in our snag tests. While this kind of fabric might be easier to wipe down should things spill on them, it is probably not the nicest to sit on. The frame on this stroller is pretty rickety feeling and one tester even equated it to the kind of stroller the "Clampets" that the "Beverly Hill Billies" might use. It has a lot of flex and rattling because most of it is connected using rivets. The wheels are aluminum with adjustable spokes and pneumatic tires, which are nice but have a lot of wiggle in the axle. The fit and finish of the stroller are similar to the Baby Trend Expedition, but not as tight and well fitted. In fact, the two look similar enough to have been made in the same factory. The canopy is not as nice and tight and the frame seems pretty loose. All of the fasteners are exposed as opposed to nicely hidden like other strollers which make the overall look not as nice and the potential to snag on things higher. The fold is the same as our last review on jogging products previous version of the Baby Trend Expedition fold. We aren't fans of the fold on the Arrow or the old Expedition and we hope to see a design change in the future. The handlebar on the Arrow is adjustable in height and it is covered in a textured rubber grip. The grip can get a little slippery when wet or sweaty, but it is comfortable in the hand when not moist. The downside is the brake cable gets in the way of gripping the handle and it gets annoying to keep grabbing it when we didn't want to. We rated the handle comfort as poor compared to the competition. The Arrow does not have adjustable suspension, but it does have a sling style seat and some padding on the seat. it is probably not the most uncomfortable ride in the group, given that there were strollers with no suspension and two with hard plastic seat bottoms instead of a sling style. The Arrow earned a 6 of 10 for safety. This is the average score for this metric and 2 points above the lowest score stroller, the Schwinn Turismo. The highest scoring products for this metric are the Thule Glide 2, Thule Chariot Cross 2 with Jog Kit, and Baby Jogger Summit X3 with 7 of 10. The Arrow has a double brake system that we don't like as much as single action. The brakes are hard to set and parents might forget to set both brakes which mean the brakes are not set. They are the most difficult brakes in the bunch. You must make sure the brake is engaged when you push down because it tends to pop out of the up position and hit the top of the cogs on the wheel part instead of the grooves of the brake fooling you into thinking it is seated fully when it is not. There is some play in the brakes, but it does require more pounds of pressure than other strollers to slid forward or back. There is also some cup holder concerns with this model that the holders are shallow and set high on the stroller so the bottles could topple out. However, we will say that these cup holders seem to keep bottles in place better than most of the competition because they have some rubberized flaps around the edge of the holder that helps hold bottles in place. But we do still caution parents that cup holders up high could result in bottles falling on heads of babies. The harness is a 5-point harness that is fairly easy to put on and adjust. It seems to adjust smaller than most of the competition and will work better for smaller riders. It has nice padding that is in the right place and seems cozier than some of the competition that either lacked padding or not enough or in the wrong place. It also offers multiple shoulder strap adjustment points with adjustable crotch strap. This stroller does come with a safety wrist strap, but it does not say where parents should attach it. We feel like there is also a potential safety risk with the fold and unfold mechanism on this stroller where the product bends. The two portions of the frame are attached to the folding mechanism that allows the stroller to fold in half. This mechanism is made up of a plastic hinge. The hinge folds in such a way that it can potentially pinch fingers or even small hands when opening. This is a similar hazard to a previous version of the Baby Trend Expedition that has since been remedied. We think it would be an easy fix for InStep to make and would likely help this product earn a higher safety score. The weight and folded size of this stroller earned it a 7 of 10 points for this metric. The highest score for this metric is a 8 earned by the Thule Glide 2 and Thule Urban Glide 2. The manufacturer lists this stroller with a weight of 29.5 pounds, but we found it to be lighter when all setup with a total weight of 22 pounds and 6 ounces. Its folded size is around 20,000 cubic inches. The Arrow is the second largest size in cubic inches out of all the products we looked at with only the Thule Cross 2 coming in larger, something that should not be a surprise given that it is a double size stroller. This means it might have trouble fitting in some trunk spaces without removing the wheels. However, on the upside, this stroller is the second lightest out of 12 strollers with only the Thule Glide 2 coming in at a lighter weight. This means you will have an easier time lifting it or lugging it around, but you are likely going to need to take the front wheel off to put it in the trunk without struggling. This stroller requires two hands to fold and is somewhat awkward to manage. Perhaps with repetition, it gets easier, but it doesn't feel like a natural movement and the seat has to be reclined to make it fold. It has a manual locking mechanism and while it doesn't technically have a self-stand mechanism, it will self-stand if you need it to. The unfold is easier than the fold, but it does have a potential for pinching fingers and hand webbing where the two halves come together to straighten out. We think this is a potential safety problem if you aren't paying attention you can get hurt, but worse if your child is nearby they could get really hurt. The unfold of the Arrow is easier than that of the Tourismo because you don't have to deal with the swivel wheel. The Arrow earned a 6 of 10 for ease of setup. This score ties with several other strollers in the review and is the lowest score for this metric, 1 point below average. The Thule Urban Glide 2 earned the high score of 10, with the Thule Glide 2 coming in with a 9. It took about 8 1/2 minutes for us to get the Arrow out of the box and ready to stroll. The documentation is pretty clear and concise making it easy to read and follow. Everything is relatively easy to assemble, but it does require a Philips head screwdriver; something not required by most of the competition that can be assembled with no tools. In addition, the manual doesn't give an attachment point for the safety wrist lanyard leaving parents to guess or do further research online for the correct and safest place to attach it. We think parents will be drawn to this stroller with a belief that this product is made by Schwinn and might contain components manufactured with high-end bicycles in mind. However, that is not the case. This stroller is made by InStep who licenses the Schwinn name to put on their product. It would appear that this stroller is almost exactly the same as the InStep Flash with the exception of the wheels and shocks. So it feels somewhat like a bait and switch move to entice parents into buying something they aren't really getting. This makes the Schwinn Arrow not really good for any application. The name on the product is misleading to its origins or its design and that makes it a product we think will fail to live up to parents expectations. We would prefer that at the very least InStep should report that it is the Schwinn Arrow made by InStep. The Schwinn Arrow is almost identical to the InStep Flash (a product we did not review) that is about $80 cheaper and made by the same company. With the exception of shocks and different materials used in the wheels, there really is little difference between the two that we can tell or that is outlined on the company website. Of course one of them says Schwinn on it and therefore might lead parents to think it is a different caliber product than the Flash which is perhaps why it has a higher price tag. If you are intrigued by this stroller and feel it is the one for you despite its poor performance in our tests, we suggest you take a look at the Flash and save yourself some money. Alternatively, you can get an even cheaper stroller in our Best Value Baby Expedition that is about half the cost. However, it may not be the best bet for serious runners. The Schwinn Arrow is a nice looking stroller that failed to perform well in our tests. It wasn't the worst stroller to run with, but it flexed significantly when being pushed and it felt rickety to us and rattled when moving. With poor scores for run-ability and low scores in almost every metric, it is hard to love this product even if it does have a brand name that is often associated with quality bicycles. Despite having the brand name sewn across the front of the stroller, it is actually made by the InStep company and is almost identical to their Flash stroller that is significantly cheaper. This bothers us. First, they draw you in with a brand name you recognize and perhaps equate to quality products, then they give you an InStep product that isn't made by the Schwinn company at all. In the end, the poor performance and low overall rank make it a stroller we don't recommend. The licensing of a popular brand name to potentially increase sales, when it isn't really made by Schwinn, just sealed its fate in our minds as a stroller you shouldn't even try. This product is made by InStep. Don't be misled by the name Schwinn on the stroller because it is just licensed by InStep for some versions of their stroller line. We also reviewed the Schwinn Turismo which did score 2 points higher in our review, however, it still didn't earn enough points to really help the Turismo in the competition. The Arrow is almost the exact same stroller as the InStep Flash. There are a few minor differences like wheel type and lack of shocks on the InStep, but even the InStep comparison chart shows the same information for each stroller. If these two strollers are similar in the same way that the Instep Grand Safari and the Schwinn Turismo are, then there might be a weight difference as well. Amazon $209.99 - 13% off!